Although enormous progress has been made over the last few years in terms of school enrolment of girls in Afghanistan, keeping girls in school until graduation remains a real challenge. Volatile security conditions and a lack of adequate facilities are preventing girls from sustaining their educational paths and completing their secondary education. Given the impending withdrawal of foreign troops from Afghanistan, there is an even greater need to continue a focus on ensuring safe and sustainable solutions for education for girls so that they are not left behind. The proposed Safe Learning Environment for Girls’ Education project will be implemented in the Afghan province of Khost and will directly benefit 176 primary and lower secondary students (131 girls and 45 boys), 500 additional hub school students (300 girls and 200 boys), and 20 hub school officials and teachers. The project will indirectly benefit 3,650 people, including the family members of the students, community residents and local labourers and vendors. This partnership with 60 million girls will consolidate access to safe learning spaces through the construction of a school building, sustaining community engagement in community-based education, and improving the quality of hub schools through School Improvement Plans (SIPs). In the Afghan constitution, education is defined as the right of all citizens and the government sees itself as setting the policy stage for education. Despite the efforts of the Ministry of Education (MoE), the government does not have sufficient resources to address the immense need in the education sector. As a result, there remains a large un met need in Afghanistan foreducation programs that promote community ownership, and for equal opportunities to quality education for girls, particularly in the most remote and marginalized communities. In the remote province of Khost bordering Pakistan, the lack of safe environment and quality education facilities discourages many girls from attending school full time and often forces them to drop out of school altogether. The overall literacy rate for that province is 28%. However, while more than 44% of men are literate, this is true for just 7% of women. In the population aged between 15 and 24, the situation for men is better with 52% literacy, whereas for women the figure shows no change (7%). On average, 38% of children between 6 and 13 are enrolled in school; however, the figure is around 61% for boys and only 14% for girls. In 2011-12, the Afghanistan central statistic organization reported that boys account for approximately 86% of students and that, out of the 2,205 teachers working in schools in Khost Province, only 3% are women. 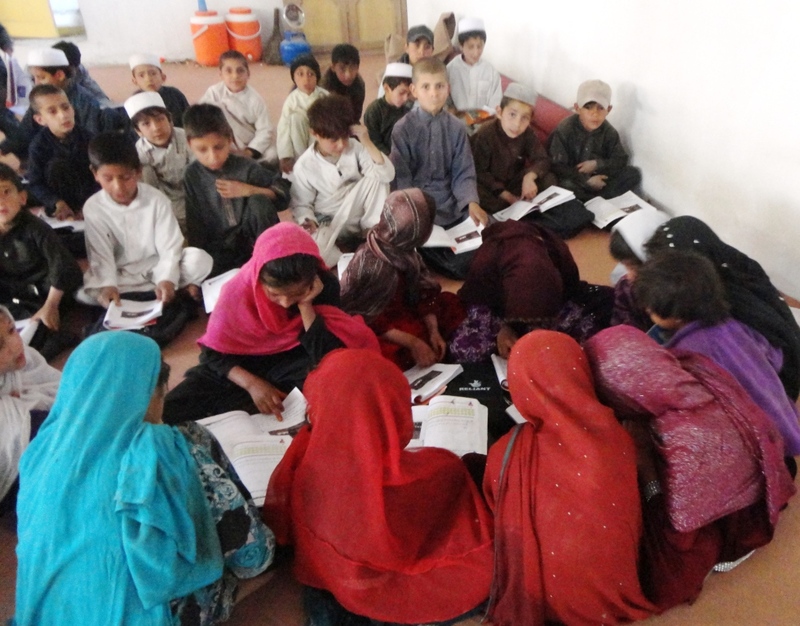 CARE is currently implementing the BEACON (Basic Education for Afghanistan Consortium) project in which most established community-based classes are conducted in people’s homes and community spaces such as a mosque. There remains an urgent need to provide permanent resources and create safe learning environments conducive to quality, accessible and sustainable education for girls. The partnership with 60 million girls will enable CARE to work with the Ministry of Education to streamline and formalize the community-based school system in the province by promoting and increasing access to permanent learning facilities for over 600 students, predominantly girls. It will create safe physical learning environments with strong support and engagement from community members. It will improve retention rates and address some of the barriers preventing girls from accessing education by adopting a twofold approach of supporting the “visible” (infrastructure development and construction) and “invisible” (community engagement and collaboration with the MoE) to improve the current education situation. The main goal of the project is to ensure that children from the targeted communities of Khost Province, especially girls, have proper access to a permanent and safe learning environment (social and physical support). This will be achieved through the construction of a safe learning space and by actively promoting social acceptance and support for girls’ education through community engagement in the planning and implementation of their own education project in collaboration with the MoE. According to the United Nations Girls Education Initiative (UNGEI) report, Afghanistan has one of the highest proportions of primary school-age (7-12) children in the world: about 1 in 5. Student enrolment in Afghanistan has increased eight-fold from less than a million in 2001 to over 7.58 million, with a current enrolment of 38% girls. Despite significant progress since the fall of the Taliban, around 4 million children are still out of school, 60% of whom are girls. One of the MoE assessments revealed that only 45% of enrolled girls complete primary-level education (at 0.63 on the Gender Parity Index, the worst in the world), while a mere 5% complete secondary education. Promoting access to safe learning spaces through the construction of a school building CARE will work with village residents and the MoE, notably local education officials, to identify the most appropriate site for the construction of a multi-classroom school building that will be used for the Accelerated Learning Program for primary and lower secondary students.The school construction project will fill a tremendous need. One of the most consistently voiced requests by students, community members, teachers and field staff is the creation of a school building. The building will consist of three rooms and will have a surrounding wall. The project will include a tube well, latrine facilities, desks and chairs for students, other furniture and a playground. Sustaining community involvement in community-based education CARE will work closely with School Management Committees on all project activities to enable communities to make decisions and engage in project management. For example, communities will help ensure the security and protection of the school building during and after the construction process. The community-driven approach will secure social acceptance and support for girls’ education in both the short and long terms. Support hub schools for high quality teaching through the School Improvement Plan Hub schools refer to the formal government schools to which community-based education (CBE) classes have been registered. Each CBE school is linked to a government school. When children are registered in grade one, they are also registered at the nearest formal government school. They will move to the formal school once they have completed the CBE school, as long as it is no more than 3 km away or their parents are happy for them to walk the distance.Through this project, CARE intends to launch the School Improvement Planning (SIP), which will enable MoE hub schools to assess their own situation and develop their improvement plans (using INEE standards as guidelines). School improvement is a continuous process used to ensure that all students are achieving at high levels. Why partner with CARE Canada? CARE Canada operates through CARE International field offices in Afghanistan. CARE first started working in Afghanistan in 1961 and is recognized as a leader in CBE provision in the country. CARE has been working with local communities to promote social acceptance and support for girls’ education through the establishment of community-based schools. These much needed schools provide an accessible learning platform within a local setting and have proven to be an effective means to extend education to thousands of marginalized and isolated children in Afghanistan. CARE runs the only non-state lower secondary education program for girls in the country, and has successful teacher training programs for child friendly teaching, and library services for quality education. CARE Afghanistan has been one of the few organizations able to deliver and support development programming in Afghanistan during the last four decades, despite very difficult circumstances and the challenging environment. This is rendered possible due to CARE’s neutrality, sound knowledge of the country, very strong community acceptance and proven security procedures. The investment of 60 millions girls will benefit from these organizational assets and will leverage existing CBE initiatives already anchored through strong partnerships with the local Ministry of Education and communities. The CBE approach for this initiative will foster social involvement and accountability and will help mitigate risks related to the lack of social acceptance. CARE Afghanistan employs the Programming in Insecure Environment (PIE) method for project implementation and is a leader in this approach. CARE Afghanistan’s Safe and Security Unit (SSU) is responsible for constantly assessing risk levels in a specific project area and will adapt the project to mitigate any risks identified during these assessments. The structure of CARE in Afghanistan already maximizes the use of local resources. CARE has gender-balanced human resource policies in line with national labour legislation and our partners are all committed to gender equality. The teams proposed are national staff with experience in and understanding of the region, language and culture of the intervention areas. CARE has many years of experience in the province of Khost and a strong network of experts who can facilitate the recruitment of additional resources as needed.